A few days ago we descended on Toronto’s decadent Kultura restaurant to tape the latest edition of YouNxt’s Na Luzie segment. Na Luzie (meaning Laid Back in Polish) is the Polish-Canadian television program airing on OMNI TV. As per usual we chatted with host Anna Piszczkiewicz about cultural happenings in the city as well as about the cool achievements of up and comers. Justyna Baraniecki is the owner of the online clothing store chicshop.ca and the style blogger at chichichic!, the shop’s blog. Justyna is also a young professional who has been featured on this blog and has even written a post or two. She is also incredibly charming. I interviewed Justyna this winter via Skype. Since then, I visit her blog for daily fashion inspiration and to secretly feed my desire for a personal shopping outing with the gifted stylist. As you will see from the segment below, Justyna’s a style trooper. She decked herself out in fancy and lightweight pieces in the dead of winter. In Ottawa. Talk about chutzpah! But that was then. Justyna just released her latest lookbook, Carnivale (violet wig and ridiculously awesome platforms included), which makes me feel like summer isn’t that far away. Finally! Na Luzie airs Saturdays on OMNI1 at 7pm and repeats Fridays at 2pm. Remember the 1990 A Tribe Called Quest classic “Can I Kick It?” (You sure can!) And, yes! It has been that long. Well, get a load of this. It’s a live cover by Paula & Karol – the totally awesome little band from Warsaw. We totally love it! But, is it better than the original? Let us know what you think. Don’t miss Anna Piszczkiewicz‘s interview with Paula & Karol tonight (Saturday, Feb 19th) on Na Luzie (OMNI 1) starting at 7 pm. (Repeat Friday, Feb 25 at 2 pm). We’ve got some exciting news. YouNxt is teaming up with Na Luzie (Laid Back) – the Polish-Canadian television program airing on OMNI to bring you some of the most interesting and entertaining segments produced by Host and Reporter Anna Piszczkiewicz. We’ll also regularly provide previews of the show’s newest episodes. If you watch Polish television on Canada’s OMNI channel then you’re already familiar with Anna Piszczkiewicz. She is the dynamic Co-Host and Reporter for the Polish-language arts and culture program Na Luzie (Laid Back). Ever week Anna brings viewers, across the country, interesting stories relating to community events as well as the people behind them. With a knack for staying on top of the cultural beat she profiles rising local artists, filmmakers and musicians. We love her work and admire her great dedication. Why did you choose to work in broadcasting? I came into broadcasting as a teenager, out of curiosity. And fell in love with it. It may sound sappy but it’s true. What are you currently studying in school? I’m completing my masters in journalism at Ryerson. How do you manage to balance work and school? I drink a lot of coffee. Preferably with a friend with whom I can go on and on about the inane but oh-so-important stuff. Also: a good breakfast, dancing in the kitchen and a daily to-do list. What direction would you like your career to go in? I’m always open to new opportunities but long form journalism is the Holy Grail. What are you working on now? 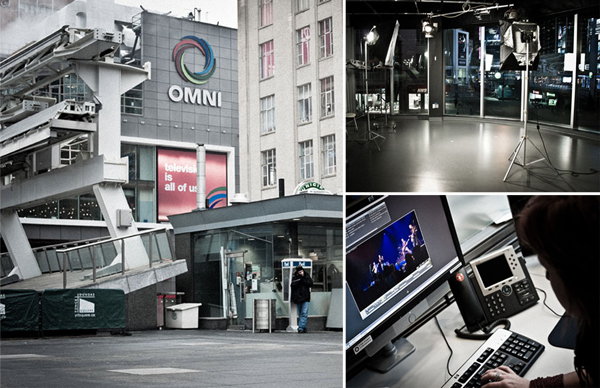 I’m co-host/reporter for the Polish-language arts and culture program Na Luzie at OMNI TV. What drives you in your work? Telling a good story. What’s the most exciting thing about working on the show? Always meeting new people who are pursuing something they’re passionate about. It’s a privilege to get access to their lives and exciting to share what I’ve learned with the audience. My interviews are on arts and culture so they aren’t necessarily things you need to know but ideas about living that, I hope, both inform and inspire. What are your future plans? (not necessarily work related) I have never regretted spending money on travel so I’m always looking to remedy my wanderlust. Who were your mentors growing up/who are your mentors now? I’ve always been fascinated by director Krzysztof Kieslowski — traditional cinema that’s innovative all at once. I read in an interview that he left documentary work behind for feature films, in part, because the closer he tried to get to someone, he drove that someone away. Perfectly natural, of course. The most sincere moment he was after disappeared as soon as the camera turned on. It’s idealistic, but I’m chasing after capturing that moment. Do you have a motto that you live/work by? The Golden Rule (do unto others as you would have them do unto you) is a good principle to keep in mind at work and play. What was the best career advice you’ve ever received? It’s often not the best writers that become successful at their craft but the ones that don’t give up and keep at it. My university writing prof said some version of that to a class. The sentiment still rings true. What little things in life do you enjoy the most? A good cup of coffee, a game of Scrabble as well as wild blueberries, sour cream and sugar mashed together. Favourite TV Show: How about a small sampling? I feed my vampire craze with: True Blood. Laugh with: How I Met Your Mother. Dream with: Departures. Admire from across the pond: Top Gear. Favourite Band or Musical Performer: A few that have been getting regular play recently: KT Tunstall, Hey, Hybrid, incarNations, and Paula i Karol. What does being Polish mean to you? Having a double identity but not the fancy spy kind. It’s more about being on the outside looking in. Knowing the culture without necessarily living it in (we left when I was three and a half). It’s a fascinating place to be. Why are your Polish roots important to you? They mean a different worldview, a set of priorities and I can read some fantastic literature in its original language. Warszawa or Krakow? Someone once said that the best place in Warszawa is the train headed to Krakow. I kid 😉 I choose Krakow. It’s my hometown. Website or Contact: I’m @katania on Twitter. This is where non-serious stuff goes like me sharing that I have a closet full of clothes and nothing to wear. (Like you can’t relate).